The Exetor Chiefs Rugby Academy are recognised nationally for their success and have a proud tradition of producing homegrown players, who have made the step from regional classrooms to that of the international rugby stage. Young players from 13-16 initially come through the Elite Player Development Programme and Developing Players Programme. From ages 16-18, the club's associated colleges look after them to continue their development, with its purpose to produce future England internationals. As the analysis of video content is carried out in Nacsport, the Chiefs wanted a way to easily share this amongst their players and interact with them. 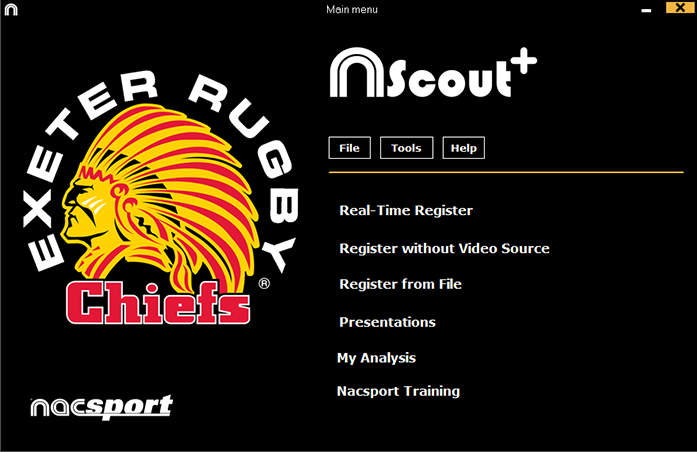 With Nacsport, the Chiefs can easily manage the College teams and Academy players, easily sharing videos for review and commenting along with gathering data and feedback from players about their wellbeing and playing times for example with the Questionnaire tools available. Gareth Elliot took the time to share their use of Nacsport. We would like to thank Gareth and the club for their continued support and wish everyone in the club the best of luck for the upcoming season. 'Moving forward with Nacsport after several years working with the software as an academy, we will have more coaches and players using the system and providing more detail for the analysis we will be delivering. In terms of advances in the way we use Nacsport, we are really pushing forward with our use of simple functions such as the calendar, which is helping the academy as a whole keep up-to-date with what’s happening at different locations. We are also further developing our questionnaire system to keep track of the stress and demand put on young athletes, in line with our long-term athlete development.